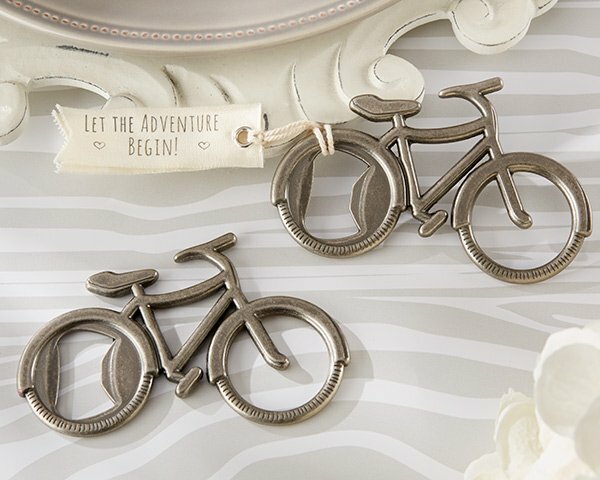 Let the Adventure Begin with our Bicycle Bottle Opener Favors. A fun way to celebrate with your guests, embrace your whimsical side with this useful gift. Your guests will enjoy using the bottle openers in their own home while recalling fond memories of your event. Each bottle opener is made of metal with a pewter finish. A fabric tag is attached that reads "Let the Adventure Begin!" Product dimensions: 3.25" x 2.5" tall. Can you personalize the note on the tag? I'm sorry personalization is not available for this item but you can purchase a personalized tag separately here. I'm sorry, since we ship directly from the manufacturer we're unable to make any changes to the item. They are shipped exactly as shown and described on our site. Placing an order now for Bicycle Bottle Openers. Will these come in individual little boxes as well? Unfortunately, the Bicycle Bottle Opener Favors are bulk packed. Each bottle opener is made of metal with a pewter finish. A fabric tag is attached that reads "Let the Adventure Begin!" Grommet in bicycle wheel acts as a bottle opener. How big are the bikes? Only one color? 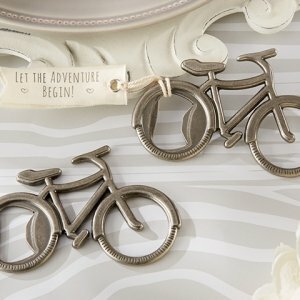 The Bicycle Bottle Opener Favors measure 3.25" x 2.5" tall. There's another Bicycle Bottle in copper, click here.